Right now everything seems to be in transition. The trees are going through a wardrobe change. It is almost as if a stunning wedding is about to begin and everyone is showing up in their cherry-blossom pinks and pearly-white-petal-soft gowns. The ground is sprinkled with bits of pink and white floating off the branches. Little yellow buds are slowly popping up, and the winged orchestra is flexing it's lovely chirp in preparation for this grand affair we call Summer. I find myself painting my long-neglected fingernails and donning a new blossom blush on my winter white cheeks. The coarse corduroys are slowly finding their way to rear of the closet, and lovely soft colors with shorter hem-lines are moving forward. The freckles are darkening and the hair will soon lift a layer of dark red for a more subtle strawberry strand here and there. Fresh spring is in the air. Fresh scents of warm mud and green grass. Fresh thoughts of garden plots and Rhode Island Red chickens coming to live at our house. New things. New life. New beginnings. 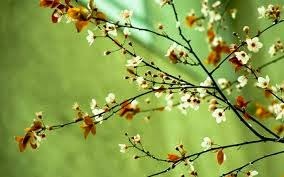 Our hearts all need the Spring. We all need to shed the heavy scales of winter weights. We need to feel the blanket of new grass between our bare toes. We need to remember that our Creator makes all things new. Even in this world, in this body, and in these pressing times there is a bubbling, gurgling chuckle of the spring bursting from deep beneath the earth. There is the promise of new, warm, sun-filled happiness. There is a call to the soul to remember that nothing can overshadow the mighty hand of the Creator. No blanket of snow, no darkness of night, not bitterest of colds can stop the budding beauty of all things new. What Love the Father has for us....What grace beyond all measure. 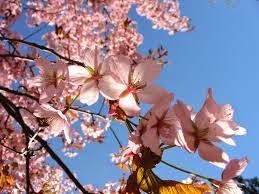 May the dogwood's flower and the lily's beauty prick our hearts and stir our souls to remember His great love. 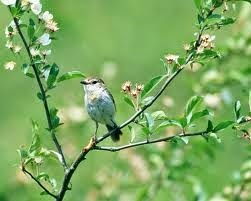 May the chirping robin be a stirring to tell the story.... He makes all things new! I saw a man on Saturday bravely wearing a red pin-striped suit, black cowboy hat, and fancy jewel studded boots. He was dressed to the nines in this "Vegas Cowboy" look. He walked into the steakhouse like he owned the world. There certainly was not a shortage of confidence in this fella. Of course anyone capable of wearing this interesting ensemble probably had enough confidence for everyone in the room. Never-mind the fact that the lady on his arm had no teeth! At first, I wanted to chuckle. It seemed so strange to see someone so boisterous walking around with such heirs. But, then I thought to myself how fun this world would be if we all walked a little more comfortably in our own skin. No doubt, many folks sitting around me that night would have loved to walked in feeling his confidence. In all these difficult days that our family has encountered, I am learning more and more that life is too short to not wear the fancy boots. My motto is becoming, "When you have a chance, just do it!". It is easy to feel heavy under the pressures, difficulties, and various circumstances that living brings about in all of our lives. There may be long spans of time where ridiculously fancy boots are not available or appropriate. But when they are, don't hesitate for a second. I believe our joy and happiness comes from choosing to look up. 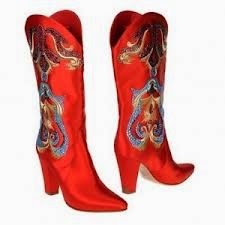 God is the source of joy, and sometimes He is handing you the jeweled boots and red suit with a grin on His face. He is just waiting for you to grab them with delight and take the town with your smile. When we frown it away, or think of all the reasons we should not...we are passing up the chance for some brightness. For me, I am learning that joy comes in lots of different forms. Some days it might be fancy boots, and other days it might be one less prescription to pick up from the pharmacy. But, joy is there for the taking. Happiness is mine if I step into it, no matter what swirls around me. So, if you happen to stop by our crazy home of ups and downs....don't be surprised...we might all be boot scootin' ! First of all, many sweet thanks to the lovely emails and comments of encouragement and prayer. This journey would be impossible if it were not for the massive amounts of love and support that has been shown on our behalf. God truly shines through you all when you reach out to us. So many have asked for more specific details of what we are dealing with concerning our situation. I try to be sensitive to Kevin's privacy when I discus his health. But I can certainly give an overview of where we were and where we are headed. Kevin's immune system has decided to sort of go on strike. It has also decided to attack healthy areas as well. There is no known reason for this to happen. He has been dealing with this for over two years. The last year has really been the most difficult. The biggest concern is his digestive system. He is unable to retain most of his nutrients, and he has lost over 40 pounds. He has been very dehydrated and just overall really sick. He was hospitalized just a short while ago because he became ill with something the resembled the flu. This ordinary virus that would be a nuisance for most of us ended up swelling his entire throat shut. There was some discussion that the medicine he was on to lesson the severity of his digestive issues may have caused some additional swelling. We were discharged when he was able to regain the use of his throat and swallow. However, we knew his other issues were still not being corrected. After we were sent home, things were decent for a couple of days, and then he became even more sick than before. After trying to handle things at home, his doctor readmitted him. They are doing all they can do determine what is causing the troubles and to get him some relief. They believe somewhere in the process he contracted an infection that is making things even worse. The main form of treatment is to battle the inflammation using steroids. While they are somewhat effective, they also cause some other issues with his sugar and with a lot of swelling. They have done some biopsies and are waiting to see if this will give them more answers on a more effective form of treatment. While he is getting some needed relief through IV meds, things are still sort of in limbo. They are controlling the symptoms with medicines, but it is not curing the problem. So, we wait. We wait for test results and we wait to see what things work and what things do not. There is a major surgical procedure that would most likely take care of things permanently, but it is not something that is considered until all options have been exhausted. We hope to avoid that process, but mostly we just want Kevin to have the best chance of getting healthy. We know it is a process. We feel like each step in the journey has brought us closer to the right people and the right procedures. We struggle with having enough patience. But we are hopeful for the right outcome. We thank you for your love and prayers. We feel encouraged knowing so many are praying for wisdom for the doctors and healing for Kev's body.